The Fujitsu FM TOWN II EX is the successor of the FM TOWN II which used an i386SX CPU instead of the i486 DX2. Even if it is fully compatible with all PC compatibles, it was primary designed to be used as a powerful game computer. It has the common characteristics with game consoles like enhanced sound, hardware sprites and scrolling and video modes : it has in fact four video modes : 640 x 480 (1 screen of 16.7 million colors), 512 x 384 (2 screens of 32768 colors), 1024 x 768 (2 screens of 16 colors among 4096) or 1024 x7* 768 (1 screen of 256 colors among 16.7 millions). 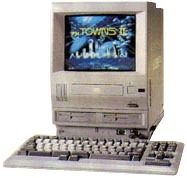 This computer had, as its previous models, a great success in Japan and a lot of multimedia and game applications were developped for it, but however was never launched outside Japan. see more Fujitsu FM Towns II EX Ebay auctions !